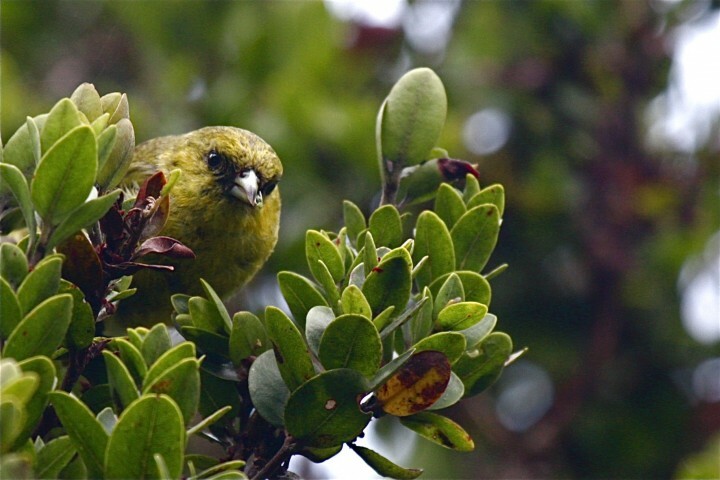 At the conclusion of the IUCN World Conservation Congress earlier this month, a resolution was brought forth to protect Hawai`i’s bird species. This resolution acknowledged the extreme and urgent need to develop techniques to control or eradicate invasive mosquitoes, thereby protecting the forest birds from the most critical threat to their well-being: avian malaria. The resolution’s accompanying discussion highlighted the particular threat that climate change holds over birds throughout Hawai`i, raising forest temperatures and allowing mosquitoes upwards into areas that were previously considered safe havens for birds. A recent study, demonstrating the rapidly declining trends of Kauai’s birds, highlights the dire situation and the immediacy of the need to control mosquitoes. The study, published this month in Science Advances, makes note of the fact that climate change has warmed the forests and allowed mosquitoes to encounter and bite birds previously unaffected by disease. This study comes a year after the release of the PICCC-funded vulnerability assessment for Hawai`i’s native forest birds, which showed that 9 of the most vulnerable bird species in the state may lose up to 75% of their range, and 6 of those species might lose nearly all their livable habitat. How will the PICCC address the threat of climate change to forest bird species? Our Hawaiian Islands Terrestrial Adaptation Initiative is intended to address climate change by bringing together resource managers and conservation planners to identify needs and prioritize key actions to reduce vulnerability and improve resilience. In particular, on-island workshops like the one recently held in Maui will allow key managers and decision-makers to improve their understanding of and capacity to reduce the effects of climate change on key resources. The workshops allow for the identification of opportunities for minimizing climate-related losses through management and collaboration, as well as the creation of products to facilitate decision-making by land managers in the face of the uncertainty.